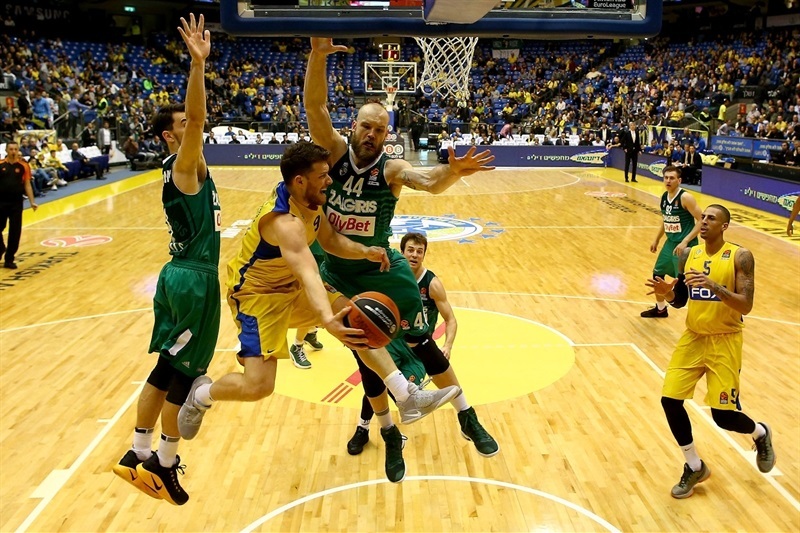 Zalgiris Kaunas bounced back from a home loss by topping Maccabi FOX Tel Aviv 77-93 on the road at Menorah Mivtachim Arena on Thursday. 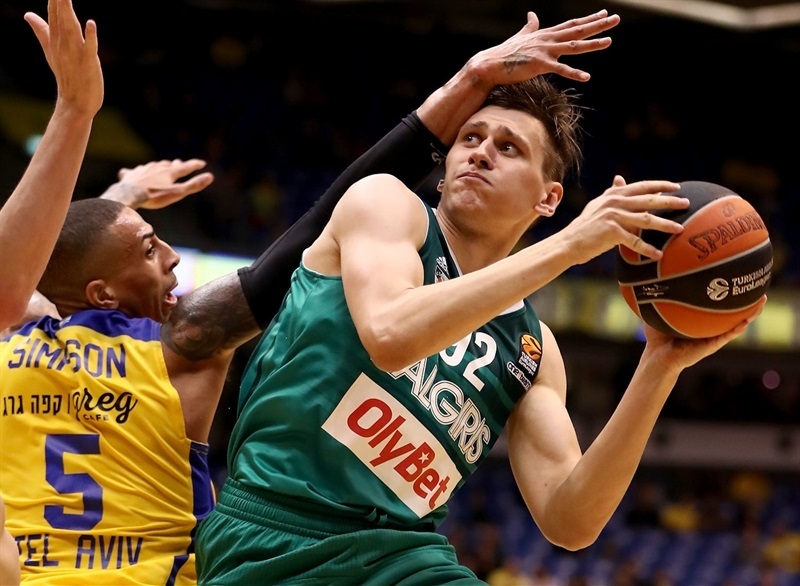 Zalgiris improved to 13-15, but despite its win was mathematically eliminated from the playoffs race earlier in the evening when Anadolue Efes Istanbul won. Maccabi dropped to 10-18. 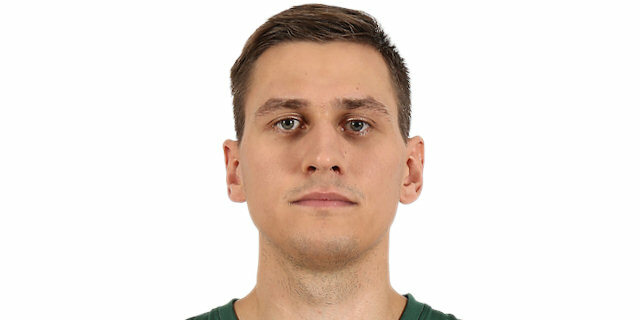 Edgaras Ulanovas led the winners with 20 points, Kevin Pangos added 15 points, Antanas Kavaliauskas scored 14, Paulius Jankunas 12, Brock Motum 10 and Leo Westermann delivered 8 assists for Zalgiris. 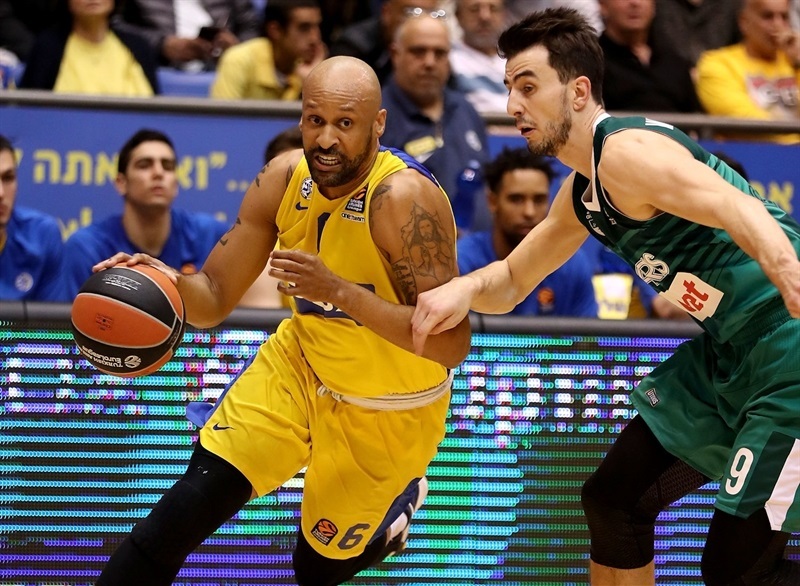 Victor Rudd paced Maccabi with 16 points on 4-of-6 three-point shooting, Sylven Landesberg added 11 points and Diamon Simpson and Devin Smith each scored 10 for the hosts. Zalgiris used a late 0-10 run to take a 33-44 halftime advantage. 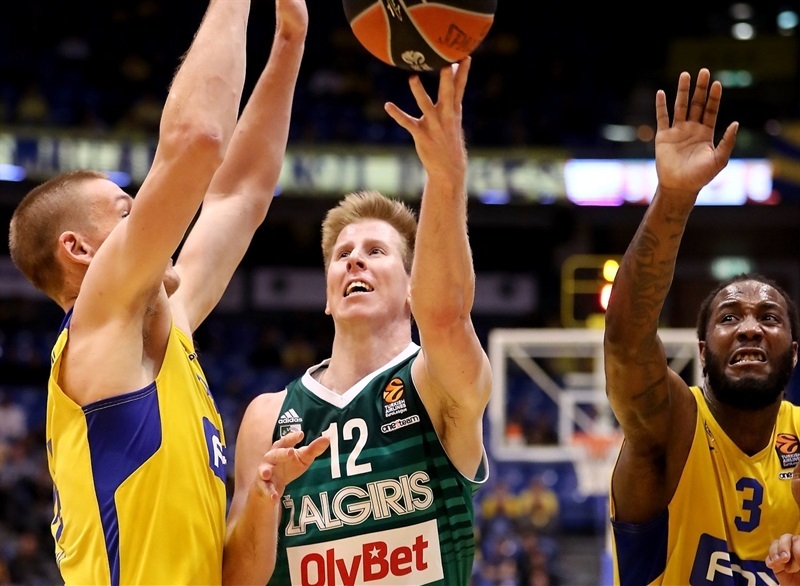 Maccabi made 14 of 24 three-point shots (58.3%) but Zalgiris dominated in the paint, making 31-of-48 shots inside the arc (64.6%). Zalgiris dished 23 assists and committed only 9 turnovers in one of the biggest keys to its win. Jankunas got Zalgiris going with a jumper. Joe Alexander and Pangos exchanged three-pointers and a jump hook by Ulanovas gave the visitors a 3-7 edge. 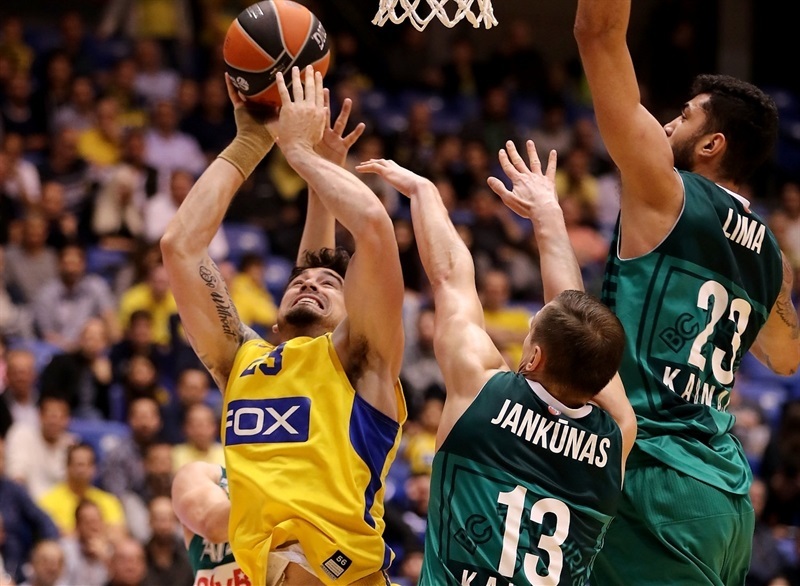 Smith and Rudd combined for 7 points in an 11-2 run as Maccabi regained the lead, 14-9. Lukas Lekavicius hit a one-handed floater, Motum added a layup and Kavaliauskas followed a dunk with a close basket for a 14-17 Zalgiris lead after 10 minutes. Simpson followed a tip-in with a jumper early in the second quarter and a three-pointer by Landesberg ignited the crowd at 21-19. 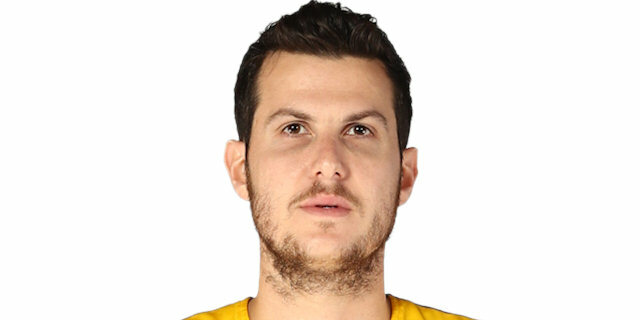 Lekavicius hit a stop-and-pop jumper and Ulanovas added a triple, but Guy Pnini struck twice from downtown for a 27-24 Maccabi lead. Renaldas Seibutis scored in penetration and got help from Motum and Pangos for Zalgiris to regain the lead at 29-32. Iverson scored down low, but Pangos and Ulanovas combined for all the points in a 0-10 run that made it a double-digit game, 33-44, at halftime. Pangos hit a triple right after the break, but so did Rudd and Smith to keep Maccabi within 10. Kavaliauskas scored down low and a jumper by Pangos made it 41-54. Simpson dunked, Rudd hit back-to-back three-pointers and Landesberg also hit one from beyond the arc to prompt Zalgiris to stop the game at 52-59. 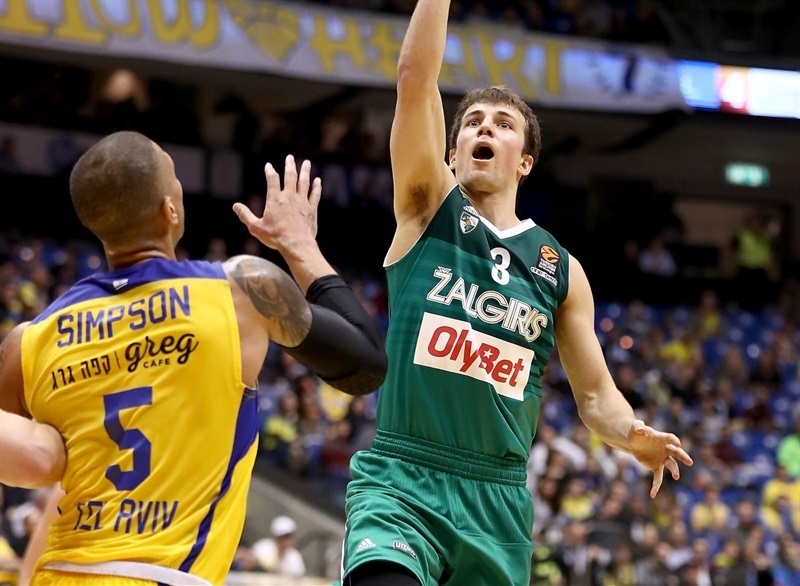 Seibutis and Pangos fueled a 0-7 Zalgiris run, but Pnini and Smith kept Maccabi within 58-68. A buzzer-beating triple by Ulanovas fixed the score at 58-71 after 30 minutes. 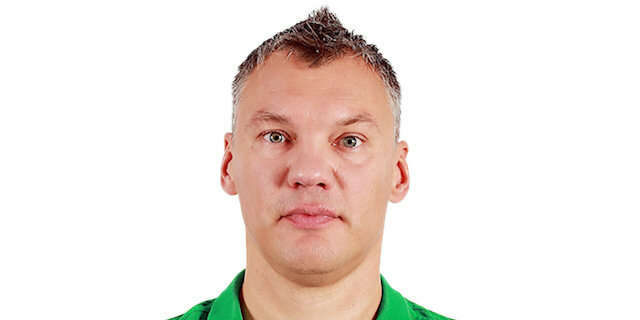 Kavaliauskas scored twice in the low post and Ulanovas copied him to keep Zalgiris fully in charge, 63-77. 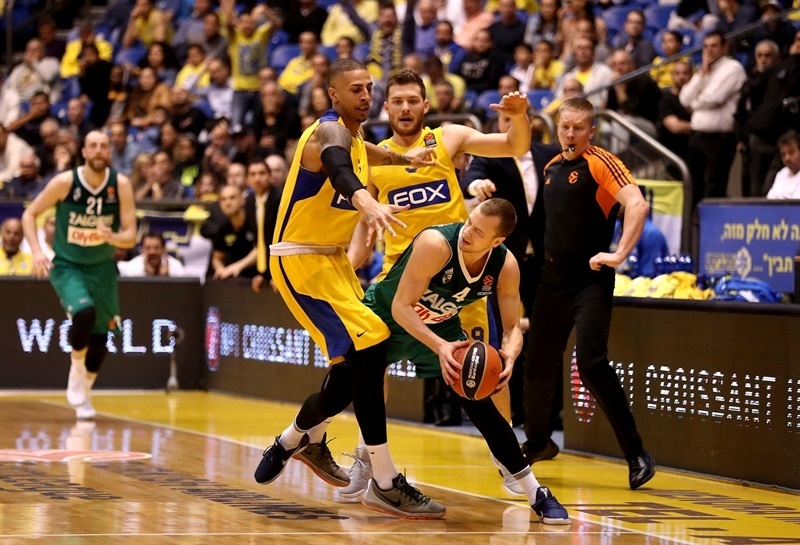 Mekel and Landesberg buried consecutive three-pointers and a power layup by Simpson gave Maccabi hope at 73-79. However Jankunas scored down low and Ulanovas followed a put-back layup with a floater to seal the outcome at 75-85 with over two minutes left. "After the win two days ago, we knew this was going to be a tough game. 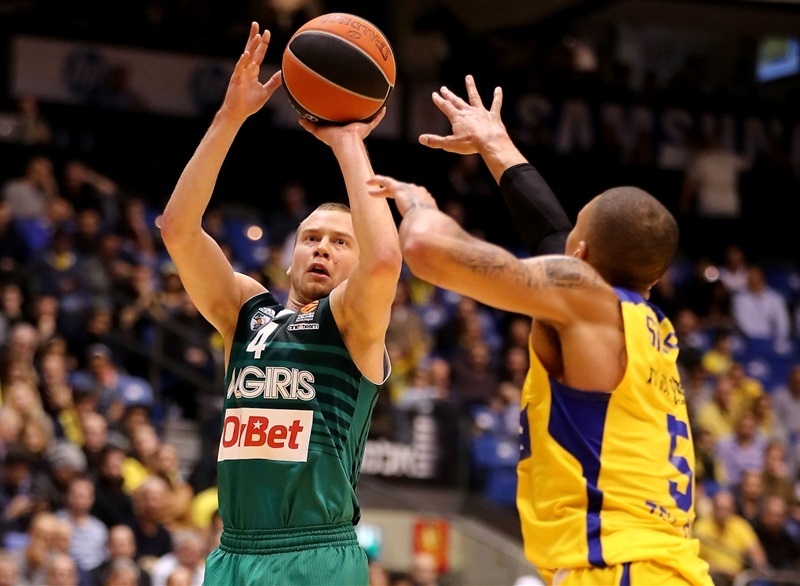 Before the game, Zalgiris had a small chance to go to the playoffs and they always play tough. Two days ago, we spent a lot of energy, maybe too much. We started the game slow, but doing the right plays the correct way. 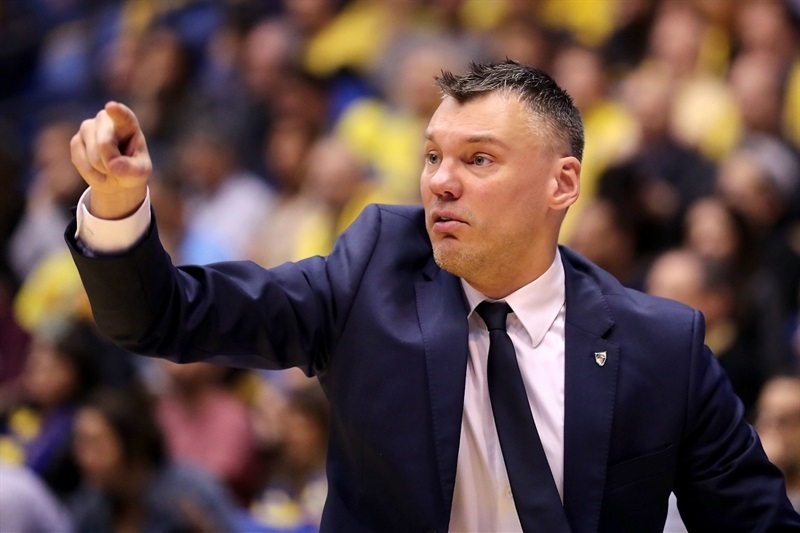 Zalgiris used every opportunity, every situation that we gave them. We were weak on the defensive end. We lost in one-on-one situations and they scored points on that. Late in the end, they found more points in pick-and-roll situations. They always found the way to score the ball. We tried to close the paint in the beginning, but it didn't work, then we tried to close the three-point line, but it didn't work either. 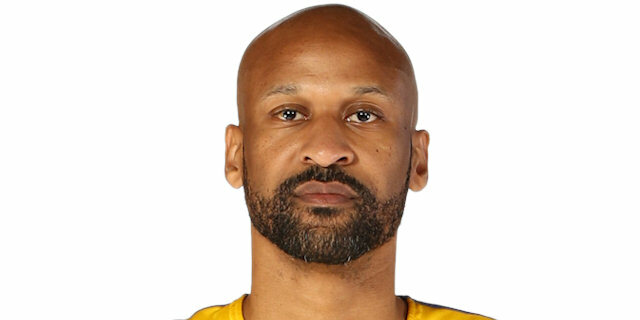 We scored 77 points with good percentages, but it was not good enough." "It is always amazing to come back. Just as much as the job and the win, I am looking forward to dinner tonight with my very good friends here. 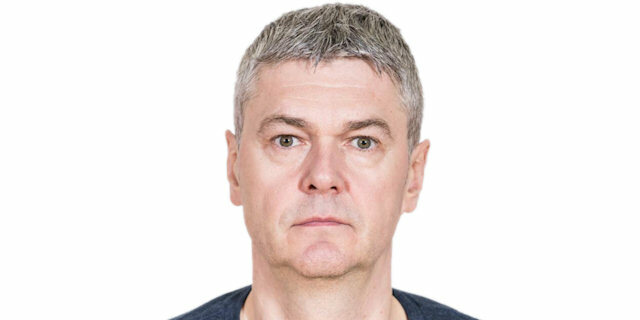 It is important to keep in touch with all the guys who were part of my life for such a long time. But honestly, we are here to work and we did well. I think we followed the game plan from the beginning of the game - obviously, it is not possible to play perfect, but we wanted to stop what we stopped and wanted to risk what we risked. A lot of their not-so-good three-point shooters hit a lot of three-point shots, but anyway, the most important is the win, which is pretty comfortable. The guys followed our systems amazingly. The effort that they give me every day is something that, as a head coach, I cannot ask for more. A lot of teams changed defenses against us in the course of a game, but my guys are improving as far as reading the situations. This is exactly what they did today." "Our problem was on defense. Despite scoring 14 three pointers on good percentages, we couldn't stop them. And also, we only scored 77 points and that means we didn't have any easy baskets." "We only played well in parts. Couldn't play consistently. We were chasing them and made a run at the end, but it wasn't enough." "It is really nice to win on the road, especially when we had a tough loss at home. We had good energy, played with really good rhythm and of course, had up and downs, mental mistakes, but overall, it was a really good win for us. Maccabi is really good in transition offense and that was the key - being able to stop their transition game with good defense. They have many one-on-one players and really good team defense allowed us to stop this."